Wooster’s Senior Research Symposium is exactly a week away, so many seniors will be spending this weekend practicing their poster presentations. Two senior Wooster Geologists have had a recent poster presentation warmup; In early April, Anna Mudd (’13) and Joe Wilch (’13) presented their Independent Studies at the 26th Annual Keck Symposium. The Keck Geology Consortium provides opportunities for Wooster geologists to work on a variety of projects with faculty and students from many other institutions. Keck projects involve an intense four-week summer experience followed by a year-long guided research project at the home institution. The symposium represents the culmination of the project, bringing the Keck team back together to synthesize their results and present their work. This year, Anna worked on the Northeast Oregon project. She studied the clay mineralogy of paleosols in the Powder River volcanic field. By identifying the clay species, she was able to interpret the climate at the time of soil formation, approximately 14 million years ago. 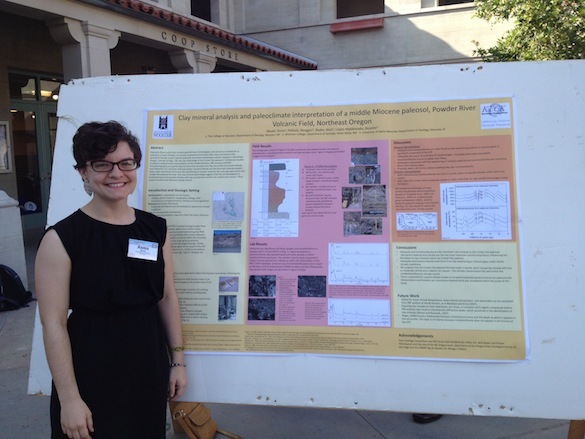 Anna Mudd (’13) presented her work on paleosols in the Powder River volcanic field. While Anna was in Oregon, Joe was in the Northern Snake Range in Nevada. He used 40Ar/39Ar thermochronology of muscovites and K-feldspars to understand how the footwall of a detachment fault was exhumed. 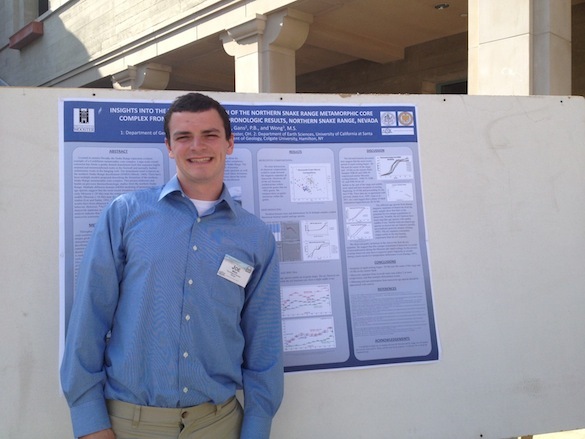 Joe Wilch (’13) presented his work on the thermochronology of muscovites and K-feldspar in the Snake Range. Best of luck to Anna, Joe, and the other geology seniors who will be presenting their research next week. If you’re in the area next Friday, you should definitely try to make it to the symposium. Most of the geology posters will be in the Writing Center in Andrews Library between 1 and 3 pm. Joe’s poster will be presented with the mathematicians on the third floor of Taylor between 9 and 11 am.